Consumer grade optical storage has always been a bit of a gamble when it comes to reliability, especially when it comes to cheap commodity media and your ‘average’ drive compatibility, resulting in burns with uncertain lifetime if care isn’t taken to choose quality media, and select suitable storage conditions for the media. Despite the declining relevance of optical storage formats, which have failed to keep pace with storage needs, Millenniata introduced their M-Disc DVD+R discs utilizing a “rock-like” inorganic recording layer, doing away with the failure-prone reflective layer and dye-based recording layers entirely. While the discs were difficult to obtain, and had limited compatibility, issues with rigidity and limited recording rates, the archival performance of these discs were proven by US Military Department of Defense testing, and it was clear from the construction of the discs that the material was in fact, very much a special blend. Of course, the capacity of a DVD is hardly enough for the modern era, so the M-Disc branding has now been applied to a range of BD-R’s at 25Gb, 50Gb (DL) and 100Gb (XL TL) capacities. Some of these were introduced over two years ago, however, I hadn’t been able to get my hands on any of them for testing until just recently when a local duplicator company began to stock them. 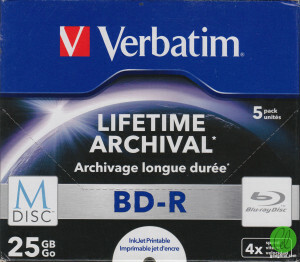 The discs in question were purchased under the Verbatim Lifetime Archival branding. While the discs themselves are likely to be produced by Ritek under license, the discs are branded Verbatim due to a co-branding agreement signed 12th January 2015. It was purchased as a 5 pack of BD-R single layer 25Gb discs, rated at 4x, for AU$45.40 or AU$9.08 per disc which is pretty expensive. The discs claim to be Made in Taiwan, which is expected if Ritek are involved. I’m hoping they’re going to be very special for that price. The outer thin card box is designed so as to be able to be separated into a display case. The front has the Blu-ray logo desaturated, which I’m sure is not an approved variation of the logo, but is likely because M-disc utilizes a similar blue in their logo and they would prefer consumers not associate M-disc with Blu-ray. 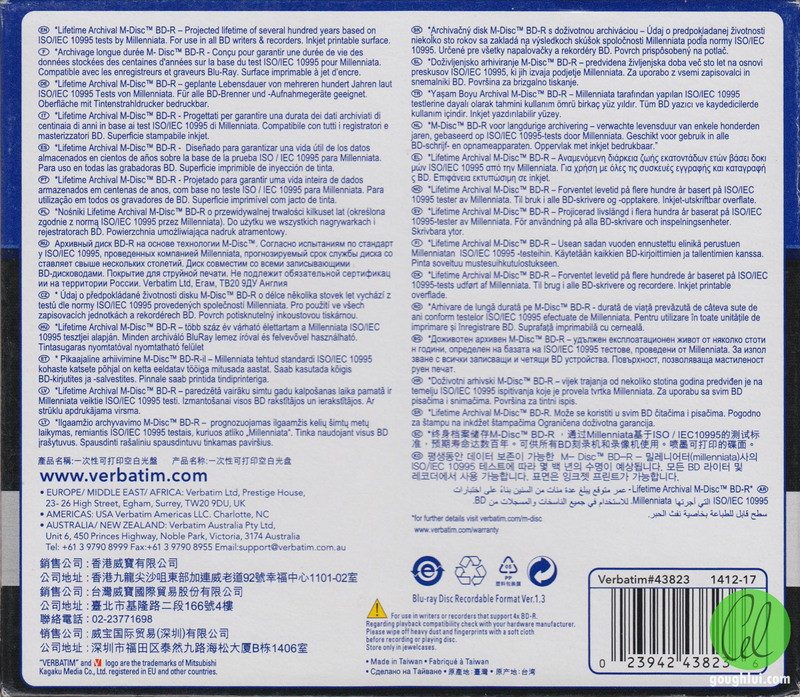 The rear of the box contains a multilingual blurb, with some marketing comparison material on the sides. The discs are inkjet printable type. I have had extensive trouble with Ritek media in the past, and have generally avoided them since, but I suppose Ritek isn’t incapable of producing good media – after all, they did produce Ricoh DVD’s under license as well, which were excellent. 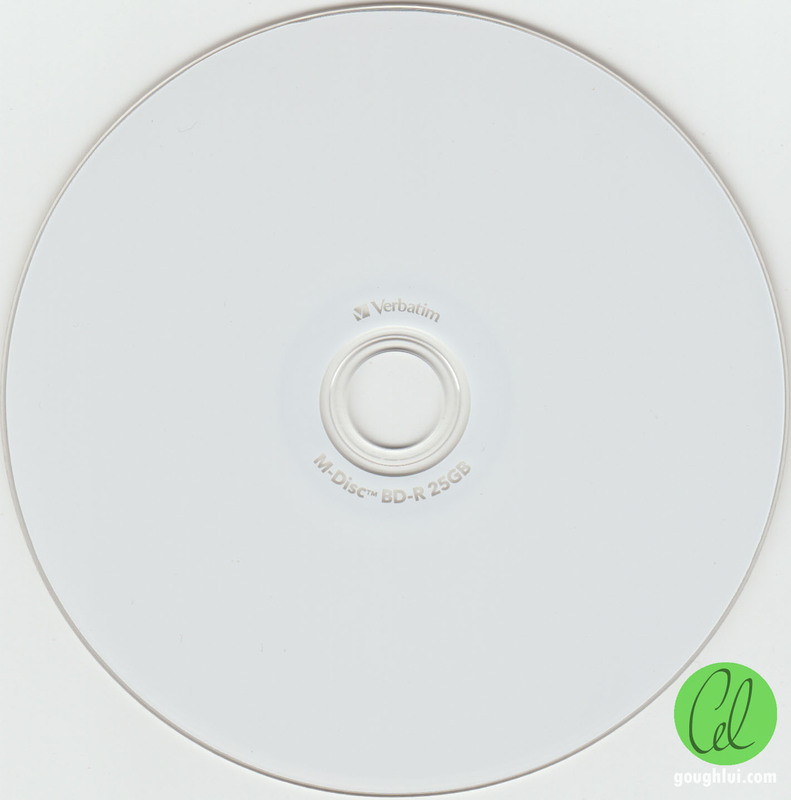 Inside, the discs are housed in a clear-tray-ed regular sized jewel case. The inlay card is folded and features an internal area for writing an index. 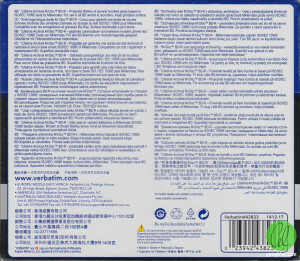 The rear insert provides care instructions and identical text to the outside rear of the box. 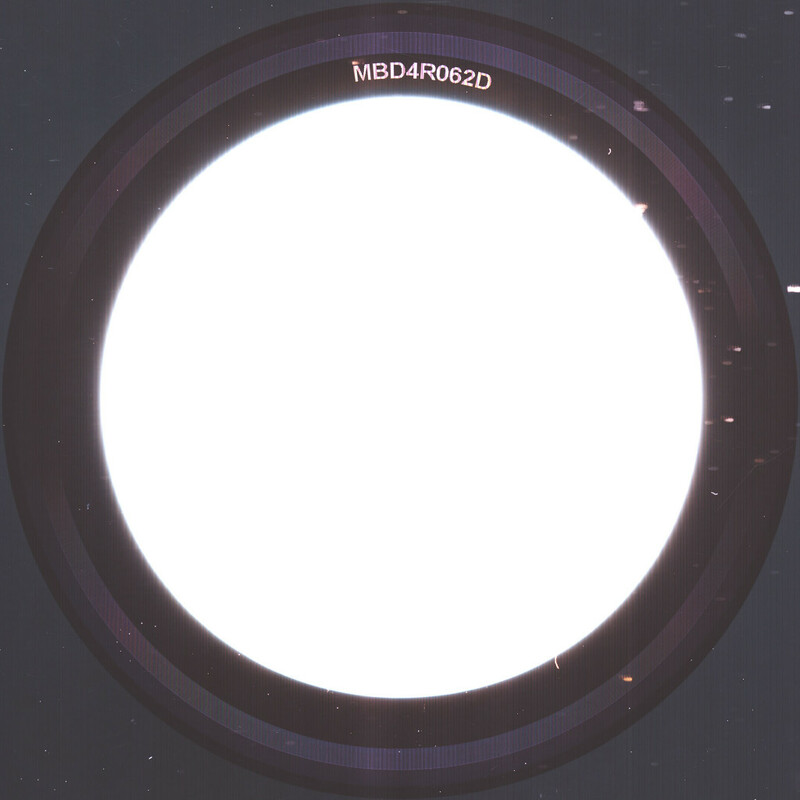 The disc itself does have a printable white top, but also features branding in the centre consisting of areas of clear hub. The underside looks pretty much the same as a normal BD-R, being metallic chocolate brown in colour. It is visually indistinguishable. The media itself has a media code of MILLEN-MR1-000, with full media code block in the Appendix One. The burst cutting area shows the text MBD4R062D. With the original M-Discs, recording was only properly achieved with M-Disc ready drives. 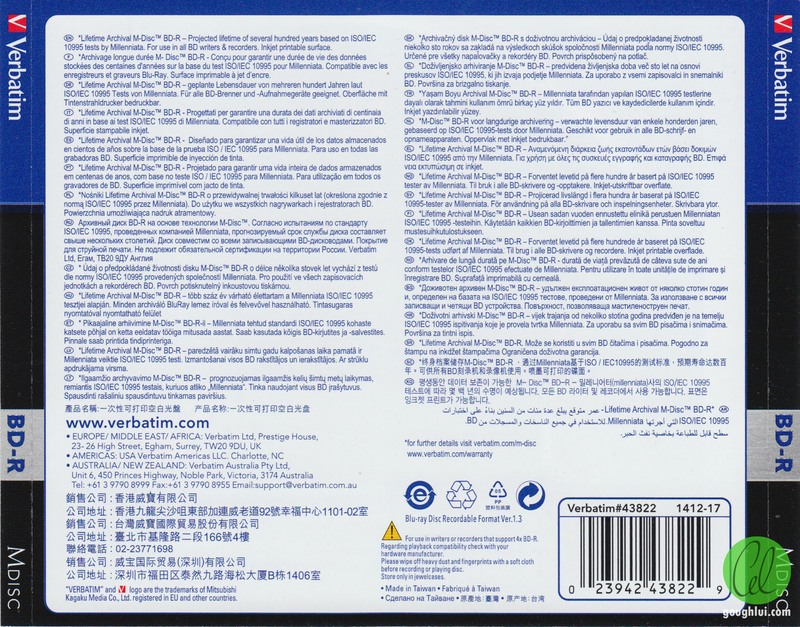 The rear of the Verbatim packaging states “For use in all BD writers & recorders.” However, a quick visit to M-disc’s webpage shows, a list of compatible drives is listed on their webpage. It seems likely that M-disc BD-R is indeed not optimally utilized in any writer, namely due to the use of a different media ID code which may not have a write strategy present in the firmware. Note: All Panasonic Blu-ray writer drives from UJ240 and newer are expected to support M-Disc Blu-ray even if they are not listed here. As a result, it seems that support for the M-disc BD-R is wider than it was for the DVD disc, which was claimed to require higher laser powers and “special” drives for that reason. Out of my drives, the only candidates are the Pioneer BDR-209DBK (my favourite), and the Panasonic UJ-240 (which isn’t particularly good). In the end, I decided to stick with the Pioneer, so as not to waste the expensive discs. According to their site, the discs should work with firmware version 1.10 and above, although a gander through the change-logs at Pioneer states otherwise (red emphasis mine). As I was running firmware version 1.30, I was good to go! 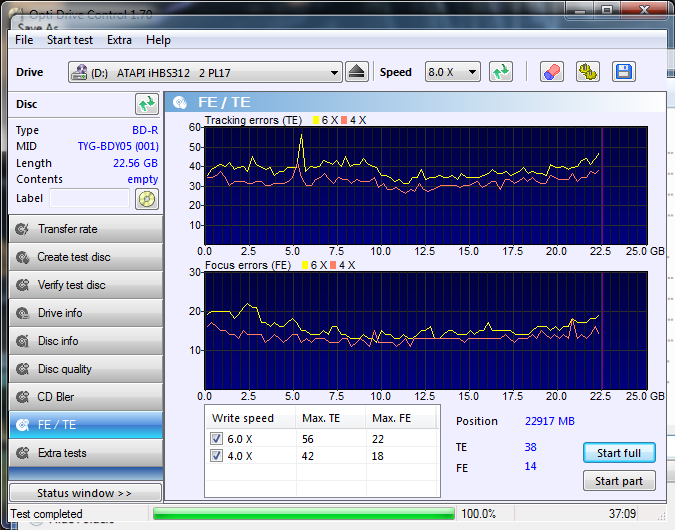 Aside from some very small bumps in the Pioneer’s transfer rate test graph, all the drives read back the disc with no read errors and at a smooth rate. A LDC/BIS and Jitter scan was performed using the Lite-On iHBS312 at 4x. The scan confirms an exemplary burn quality which low initial errors – conservatively speaking, the guideline for a good burn is an average LDC threshold is 13, and peak BIS threshold is 9, which this well surpasses. The jitter level is also very impressive at about 9.1%, stable throughout the burn. The burn quality appears to indicate the media to recorder compatibility is excellent, with no evidence of increasing errors towards the outer edge. 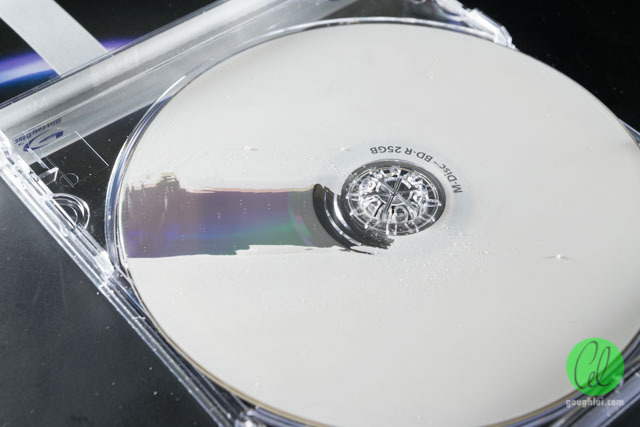 An FE/TE scan was also performed on the burnt media to ascertain the quality of the physical construction of the disc. 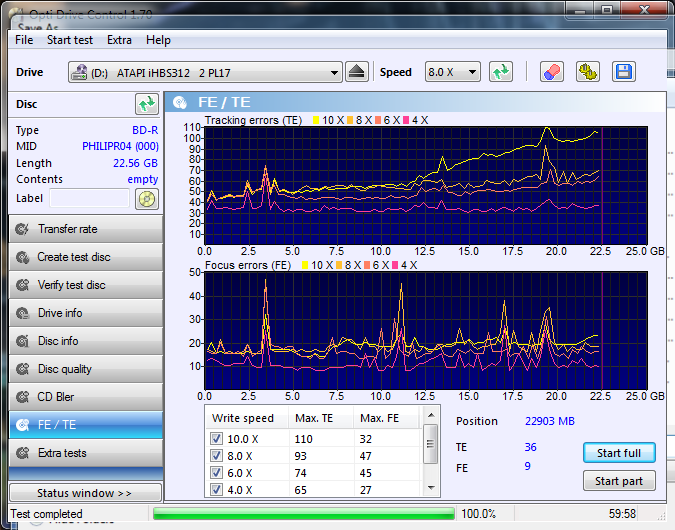 The resulting scan was only possible at 2x due to drive limitations (as the disc is not supported by the burner). The readings are relatively stable and low, which is a sign of quality disc construction. For cross reference, please see Appendix Two with FE/TE scans of other media for comparison. Wait a Minute … Detective Gough is on the Case! While the immediate burn quality seems relatively satisfactory, I was still not satisfied as to whether these discs were truly worth their premium over commodity blank media. Looking at the discs, it seemed that the recording layers were likely made of similar materials based on the visual aspect, unlike the obvious difference with DVDs. Also, it seemed that regular recorders were intended to be able to record to the BD-R’s (according to the Verbatim text). Two questions came to mind – are these discs truly different from commodity media (as the M-Disc DVD was), and how long do they last. This is where the M-disc case seems to unravel slightly. When looking at their website, it is clear that details on the BD-R version are scant. Upon looking at their website, they claim that the BD-R is based on the same 1,000 year standard. Projected lifetime of several hundred years based on ISO/IEC 20995 tests by Millenniata. So what is it? Is it several hundred years? or is it a thousand years? 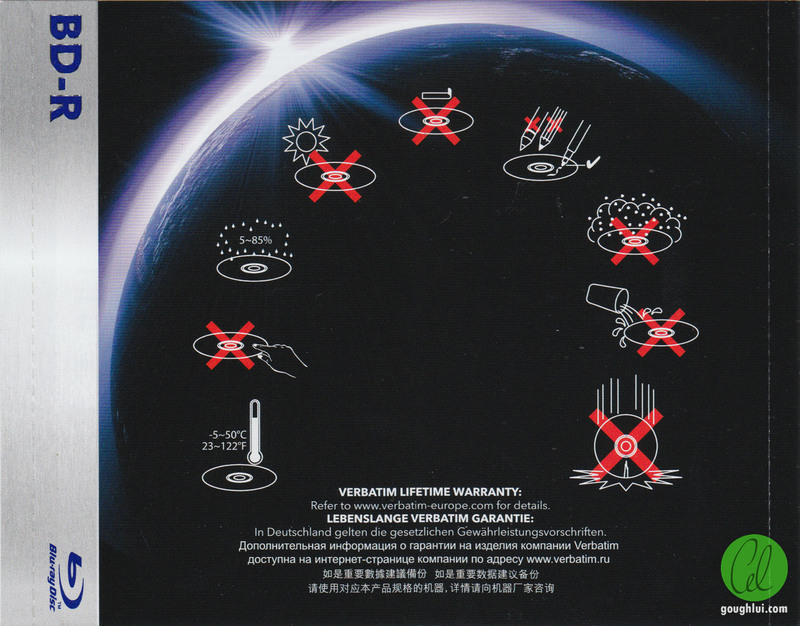 Digging further around the M-disc site, it is noted that their section on longevity testing actually features no data about the BD-R discs at all. Indeed, if there were tests, the reports were not actually featured on the site at all. Further poking around in M-Disc Technology pages shows only references to their DVD products. In fact, it seems their patented “etched in stone” material may only apply to their DVD products. Celsius and 50% Relative Humidity) of over 1,000 years. storage environment maintained at 22 degrees Celsius and 50% Relative Humidity. This possibly explains the problem with the lifetime seen above – they managed a mean expected lifetime under 22 degrees C and 50% R.H. of over 1,000 years, but 95% confidence level is only 530 years. This means it is likely that only half the batch of discs makes it to 1,000 years, with 95% of them making it to 530 years. This also implies that the standard deviation is 235 years, meaning a ~ 0.5% population of the discs may lie in the range of <295 years. Of course, this is all statistics and it boils down to the issue of the validity of accelerated life testing. Advertising your discs to last 1,000 years when only about half will is a bit dishonest. This bought me to a realization – unlike DVD’s, almost all regular BD-R discs do not use organic dye recording layers. Only BD-R LTH type discs do, and they have been shown to have poor longevity. With one of the main reasons for causing disc failure no longer an issue, it seems possible that this disc is not materially special compared to a regular BD-R. Indeed, if we look at other archival media options, there are media from MKM (Mitsubishi Kagaku Media, Verbatim), Panasonic and JVC. Lets examine these more closely. The Panasonic media claims a 50 year Archive Design, based upon 25 degrees C and 80% RH environment using accelerated age testing results conducted by Panasonic (although the results are not publicly accessible). Note that these criteria are more stringent than the M-Disc tests above, which had lower temperature and significantly lower relative humidity. 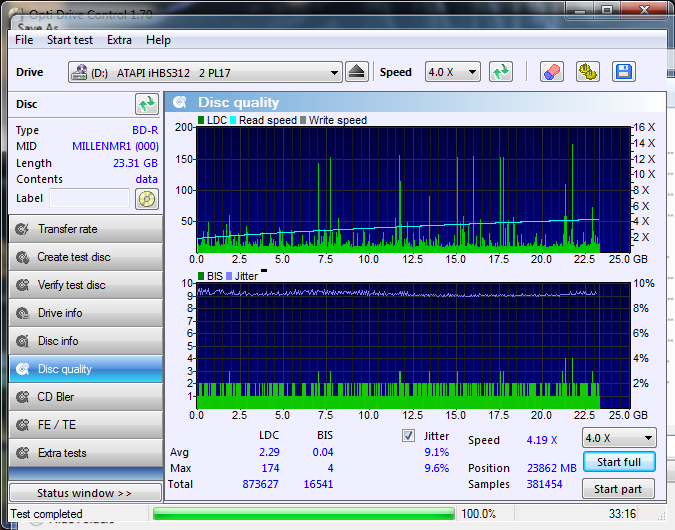 The discs are all inspected by recording drives. JVC media doesn’t appear to have much information, although they do have an archive BD-R solution which involves media testing and migration. It’s similar to what hobbyists like myself have occasionally done. 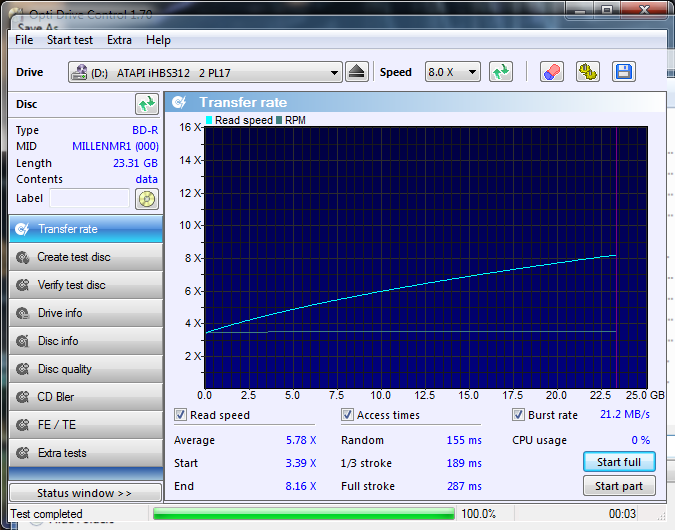 Most interesting is the Verbatim MKM BD-R DL and TL archive life test summary. When using the ISO/IEC 10995 standard for 95% confidence at 25 degrees C, 50% RH, their BD-R DL achieved a lifetime of 554 years and their BD-R TL achieved a lifetime of 3588 years. It seems that regular quality BD-R discs can achieve projected lifetimes to failure of a similar magnitude to that of M-Disc DVDs which achieved 530 years under slightly cooler conditions. I think that Panasonic may have been conservative with their lifetimes, but it seems entirely plausible based on this evidence from MKM/Verbatim that the M-Disc BD-R is a higher quality, possibly cherry-picked/factory-tested BD-R disc with substantially similar physical and chemical composition. In light of this, it seems their lack of details in the lifetimes of the discs and comparing them with other products on the market seems to be obvious as if the discs did not offer significant benefits over the competition, they could not command the high prices that they presently charge. The M-Disc BD-R commands a significant premium over the competition, and seems to offer a quality burn (with a sample size of one), albeit a slower one at 4x. Despite the initial claims of the M-Disc DVD creating the “wave” of interest, it seems that the M-Disc BD-R is not as highly documented, or researched, and this lack of information is disconcerting. Further to that, the contradictions in the supplied information really cause us to question whether the M-Disc BD-R is actually a special product and whether it does live up to the claims. From my research into the data, it seems likely that the M-Disc BD-R is not substantially different from other quality BD-R discs on the market as they all use inorganic recording compounds (with the exception of BD-R LTH of course). From a visual inspection, the disc appears the same bright chocolate-brown, unlike the obvious distinction with regular dye based DVDs and the M-Disc DVD which was a silver-grey. But my main concern lies in the demonstrated lifetimes of quality BD-Rs which are similar to the M-Disc DVD (to which the M-Disc BD-R is claimed to have also achieved). In essence, it appears that the MKM/Verbatim BD-R DL has already reached the same level of endurance as the M-Disc DVD had claimed without being “special” at all. It is thus, hard to justify paying more for an M-Disc BD-R, and I cannot really recommend it. Aside from this, it seems the relevance of slow optical media is waning, and the storage requirements for BD-R are quite onerous, as I’ve realized storing them in sleeves is a sure way to destruction over a few years. It was not until after I wrote the disc that I realized that there was a firmware upgrade for the BDR-209DBK, although the change-log does not appear to note any changes to BD-R writing since Firmware 1.30 which was used. The upgrade was successful under my Windows 7 machine, however. 0120 : 10 28 28 28 2c 2c 2c 48  48 48 38 38 38 60 98 a0   .(((,,,HHH888`.. 0190 : 20 30 30 30 2c 2c 2c 48  48 48 44 44 44 60 90 90    000,,,HHHDDD`..
02e0 : 40 50 50 50 4c 4c 4c 48  48 48 50 50 50 60 98 98   @PPPLLLHHHPPP`..
0350 : 40 50 50 50 4c 4c 4c 48  48 48 50 50 50 60 98 98   @PPPLLLHHHPPP`..
To provide a reference point, several other types of media were subjected to FE/TE scans using the same equipment. Of note is that none of the other media were able to be scanned at 2x, so direct comparison of values is not possible – but it is possible to generalize that the Millenniata BD-R appears to show good results consistent with other media. Spikes in these scans may reflect media blemishes and dust, whereas increased TE/FE is expected at higher speeds which place greater mechanical rigidity requirements on the discs. This entry was posted in Computing and tagged bluray, optical disc, optical discs, review, storage, tested. Bookmark the permalink. So the M-DISC BD is just a regular BD? (Or rather, a regular BD is already as good as M-DISC?) Their website is selling them at roughly $3 per disc. I bought around 15 of them hoping they would be of somewhat higher quality than a BD for archival purposes, but it turns out their entire company is running a well oiled scam. Thanks for the blog post, it was super informative. You should really publicize this post and get Millenniata to comment, they shouldn’t really be allowed to get away this sort of stuff. Yes, I did go to Sefton High :). I’m sorry but you’re the one that needs to go back to primary school as you obviously did not read the article. 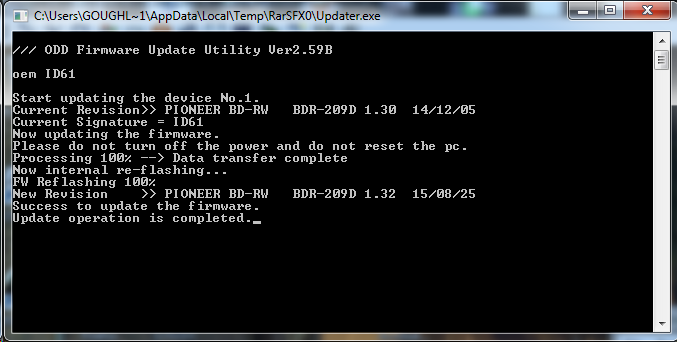 The disc was burnt with the Pioneer BDR-209DBK which is on the approved drive list as stated. The other drives were used to assess the BURNED disc readability ONLY. They did not burn the disc AT ALL. If you burn a BD-R with a drive, regardless of M-Disc or not, you EXPECT compatibility with readers, and indeed the M-Disc packaging claims readback compatibility with all drives. If you don’t know the term Transfer Rate Check aka TRT, or LDC/BIS scan, or FE/TE scan, then you shouldn’t really be commenting on this article at all. There is no flaw in the methodology. You need to open your eyes and stop wasting people’s time with misleading comments. What you call the BCA in all your posts are the ring codes or the mould codes (depending on it being on the reflective layer or not). The BCA (Burst Cutting Area) is ALWAYS a barcode, that’s written by a YAG laser and ONLY appears on DVD and Blu-ray (never on CDs). While their specifications provide support for having BCA on recordable discs it’s not extensively used, but required by some copy protection features. You can get yourself used to differentiate BCAs just looking at any Nintendo optical disc (GameCube, Wii, etc) as they use the BCAs as an essential part of their copy protection system. Specially in the last one you can see the disc has another barcode different from the BCA. This is also standard and it’s the IFPI barcode, that can be present in CDs and supposedly read by some drives (have yet to find one able to myself). Thanks for that correction – I’ll be sure to keep it in mind for future postings. I didn’t realize that the inner area was distinguished from BCA area until now, so thanks for clearing that up. Did I get it right? You suggest that the M-disc BD-R and regular BD-R’s look the same, and both use inorganic material. BUT…didn’t it take longer to burn the M-disc BD-R? Doesn’t that suggest that they are different in some way that is not otherwise obvious. Might (I say “might”) that suggest that the longevity of the recorded material might be different, too? That is true, however, one has to realize that the recording speed restriction is due to the write strategy programmed into the Pioneer BDR-209DBK’s firmware. People such as myself have, at least with other drives with more easily amended firmware, done strategy swaps and bit changes to unlock higher record speeds – it generally has little to do with the disc itself. Instead, my expectation is that they opted to lock recording at 4x as it is a CLV strategy which does not have error spikes at speed transitions that Z-CLV at higher speeds would have, and or the vibrational stability issues of CAV especially towards the outer edge of the disc. Regardless of brand, I generally stick to 4x except when testing for this reason. Just want to thank you from the bottom of my heart for this. I have a dear friend with approx. 3 months to live, and his requested contribution from me was to help him with archiving his family photos and videos. The work and information you have provided here have allowed me to perform this task with confidence, and I am endlessly grateful. The MKM/Verbatim media test document referrers to the media as “Archive BD-R DL and TL”. I am not sure that this is the same as the MKM/Verbatim discs sold on amazon [Link Removed] with a “normal” price. I don’t think these are the same and the test document might be related to the Enterprise grade and not the consumer one. Thanks for that informative link. Based on the information on the link, the consumer stuff isn’t the same as such, but strangely, the supplied test results (which are fairly small) shows that the RSER/Burst error counts of both types of disc are fairly low despite the difference. While the archive disc achieves a 10^-5 error, the MKM standard sample achieves 10^-4. This is a 10-fold difference in error, but these are mostly corrected by the first layer of error correction. The first graph, for example, shows that an RSER of 10^-3 is the “limit” of tolerance. The longer burst errors which require another layer of error correction are much closer in magnitude – about a peak of 400 for the archive disc, and 550 for the regular. In light of their own information, I wouldn’t feel bad about that, as the burn quality difference between even the same brand but different batch of discs burnt at different speeds can vary by as much – and a single speck of dust on the data side layer during burning could cause quite a lot more errors to be “burnt in” due to the shadowing effect. Of course, this second graph that does the comparison only considers the initial results post-burn and ageing isn’t clearly shown. The first graph gives a spread of probability which would imply that normal products have a shorter storage period and wider variability – but it seems this graph is not backed by any data at all, with no information on methodology and no comparison made directly of degradation trend of regular versus “enterprise grade” and its axes are unlabelled! I would take this as just “illustrative” but not exactly anything more than a “marketing diagram” – it may well be that the different in storage period is less than depicted as degradation rates are non-linear. A difference in error rate of 10-fold does not automatically mean a 10-fold lifetime increase as errors typically stay stable throughout the disc’s lifetime, only sharply increasing towards the end (at least, in my experience). Specifically, note that the article itself has dates of 2012 for the release of the products. This predates the claimed release date of M-Disc which was planned to be launched Q2 of 2013 (http://www.storagenewsletter.com/rubriques/optical/millenniata-blu-ray-m-disc/) but probably didn’t launch until later as most of the reviews date to 2015. This suggests to me that MKM’s formulation is independent of M-Disc’s “own” technology and achieves a similar level of lifetime, which implies to me that the material is likely to be very similar for the BD-Rs – archive or not, from vendors other than M-Disc. 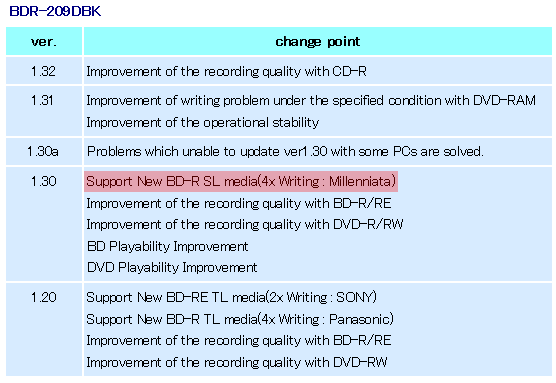 In fact, the difference could be related to the fact that under the notes section, point 3 is “The recording characteristics of our professional archive discs are optimized for Pioneer’s professional BD drive, BDR-PR1/BDR-PR1M. Accordingly, no guarantee of recording quality or correct operation can be given when using drives other than BDR-PR1/BDR-PR1M.” The difference in performance could be due to the use of a different recorder, or a recorder with less-than-optimal write strategy. The comment posting by “mtrash” on http://www.pcworld.com/article/2933478/storage/m-disc-optical-media-reviewed-your-data-good-for-a-thousand-years.html seems to support the hypothesis that the material is very similar. At the end of the day, I don’t really have any alliances with any company – M-Disc, MKM or otherwise. Their success or failure is really immaterial to me. What I’m interested is the most cost-effective solution from a lifecycle basis, including time and energy, to archive data with a given level of reliability and longevity. I have found that BD-R no longer meets these needs due to the skyrocketing need for greater storage, and because the physical construction of the disc (with only 0.1mm polycarbonate overcoat over the data layer) is vulnerable to damage from something as simple as resting against a patterned storage sleeve (http://goughlui.com/2015/04/13/warning-dont-store-blu-ray-discs-in-sleeves-heat-gun-revival-technique/). Mea culpa, I suppose, although earlier Ritek media (http://goughlui.com/legacy/stateofbdr/index.htm) also failed quite demonstrably as well which is why I had to investigate storage behaviour in the first place. Every other vendor of disc I have tried has not faulted (at least, not so spectacularly) … but given earlier M-Discs were made by Ritek, you could probably tell why I was somewhat reticent to try it out. What do you suggest for long term storage if BD-R does not meet your standards? You mention how the LTH blu-rays have poor longevity. I have been using the triple layer 100GB BDXL’s from Verbatim, but I can’t tell whether they are LTH or HTL. Do you know of a way for me to tell what kind they are? Also, does Verbatim’s “hard coat” protect against humidity? You said it yourself in the post ” the archival performance of these discs were proven by US Military Department of Defense testing”, this is what makes me have doubts about your findings. This article is taking about their Verbatim M-Disc BD-R, of which NO SUCH proof of testing is available. Only the older M-Disc DVD products had military testing, and obvious differences, namely a dye-less recording layer made with inorganic material. Next time, read more than just a sentence please. 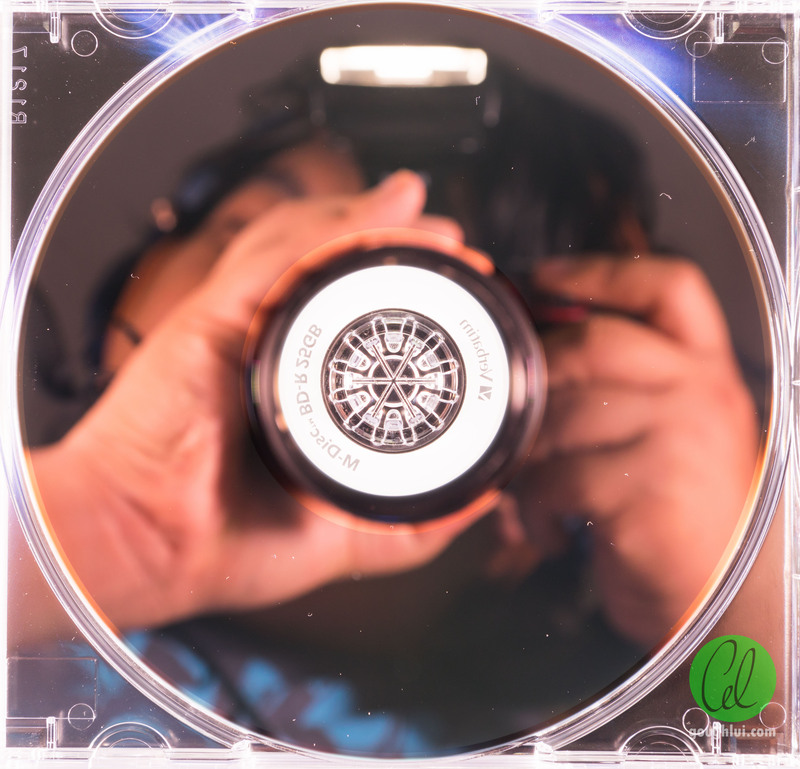 At first in DVD and Blu-ray M-Discs there was difficulty distinguishing the writable side of the disc, so they added color to distinguish the sides and make it look like the coloring on standard DVD or Blu-ray media. I’m not too sure about the truth of that, especially seeing as the company has been quite loose with its words and descriptions of its technology and a lack of cited technical evidence. At least in the DVDs, the writeable side is a shiny silver-grey colour, the top side has a bit of a grey-green tint to it. The BD-Rs however look much the same in colouration as regular BD-Rs of the bronze-colour on the data side. I suspect there is a reflective layer, but I can’t be sure. Scraping away the printable layer on the top of my M-Disc BD-R reveals a silver surface (under the polycarbonate) which appears to be a conventional reflective layer with a fairly high reflectivity. I don’t have access to a gas chromatograph to determine the chemical composition, however, I really don’t think the M-Disc BD-R utilizes the same technology in their DVDs which have been tested and proven. It doesn’t prove much – but at least it looks much more reflective and less “translucent” compared to the original M-Disc DVD’s “lack of reflective layer” exhibited – you could literally see fingers through it. Here, you can’t even see the text in the jewel case. Well, I didn’t forget about this, but sadly the results are still inconclusive. Despite slitting the overcoat right through and seeing a little delamination, no oxidation occured on the M-Disc and the control CMC Magnetics disc. 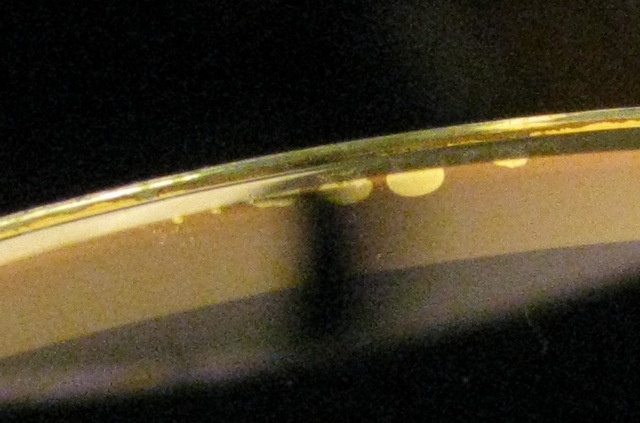 Both discs suffered slight delamination, but neither had their reflective layer oxidise yet. I’ll leave it for longer, but Australia’s mostly dry winter climate at the moment probably doesn’t help. my verbatim bd-r 25gb definitely have a absolutely cd-r like, mirror like reflective layer on the top (non data-writable) side. Wow, that’s quite a helpful post. Thanks for doing all that testing and research. 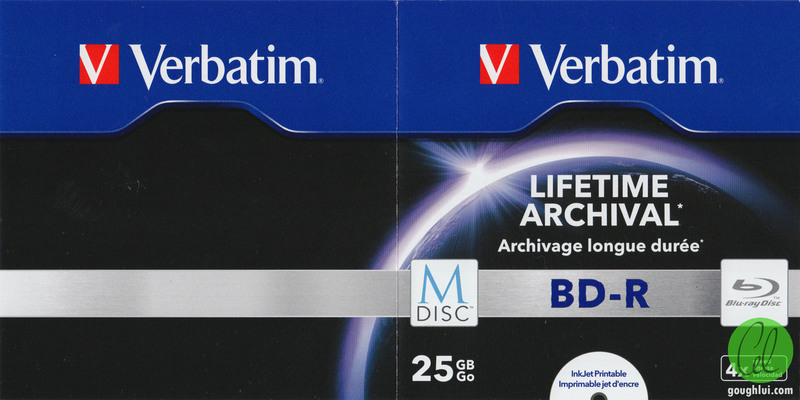 Do you have any info on Verbatim’s DataLifePlus BD-Rs, in terms of what their projected lifespan is, and what kind of recordable layer they use? I’ve been trying to find this out for days and days and can’t. On Amazon, people insist that it uses dyes, but I thought that all HTL media, (which I assume these are) uses inorganic materials these days? 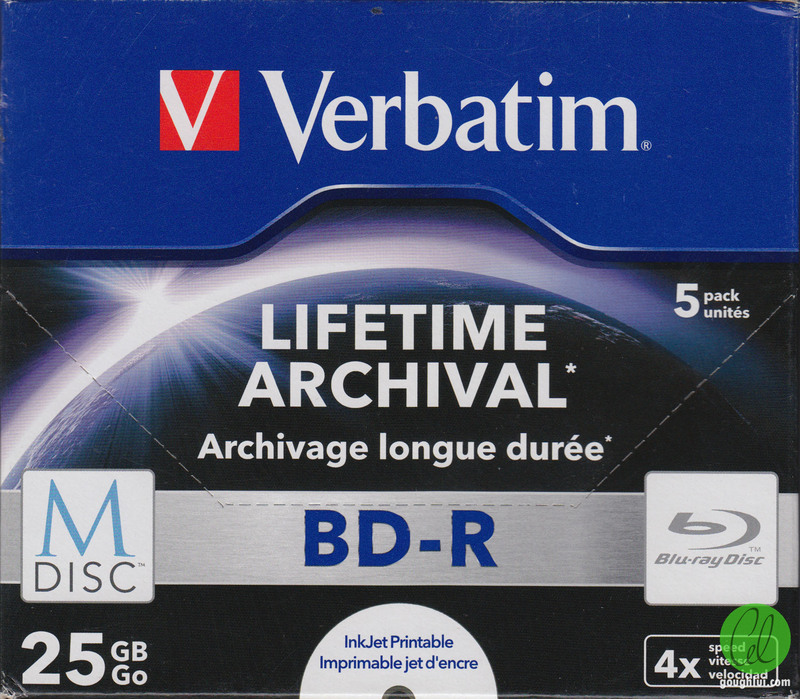 Also, in your post above, it says that Verbatim BD-R DL is shown to have a similar lifespan to M-Disks. Does that also apply to Verbatim’s single layer BD-R? If you could shed some light on all this, I’d much appreciate it. in this thread, it shows evidence that all bd-r media use inorganic data layers, IE similar to m-disc dvds, so not subject to nearly as much light exposure degradation. i havent seen any actual tests other than the verbatims in this thread though! also, up to beginning of this year when i checked this thread, m-discs appear to have never tested their own bd-r, and in fact show ONLY 3rd party dvd media tests publicly! The only real thing I can think the M-DISC might do a better job of is keeping a clear distinction between the reflective and diffuse state of the inorganic layer. This would lead it to potentially retain more readability when the hard coating wears (a hardness test on the normal BluRay vs M-DISC would also help with this). However, it might also just be a way to keep the currently existing production lines that the M-DISC DVDs used alive and kicking, which to me sounds like the most probable scenario (for monetary reasons most likely). Excellent article. I have been desperate to learn the real story behind M-DISC vs any other typical Bluray. And through your article was helpful in rasing excellent debate ponts either way, I consider this following M-DISC test by a person in the U.K. to be of enough value (to me personally) to justify M-DISC as a worthy, tried-and-true archival bluray solution. That article is missing some information. First off I’d like to see both sides of both desks, second off the last picture he shows before he says I’m going to now play the restored disk, is the magic marker side of the tdk non mdisc desk. It’s not always possible to trust an article like this, it is also possible for a post like this To be fabricated. Already suspicious is this is a commercial website selling a particular Blu-ray drive Every issue including the existence or not of a so-called reflective later has been covered in this thread. The only thing that article does to add is a test which shows a couple of incomplete photos.